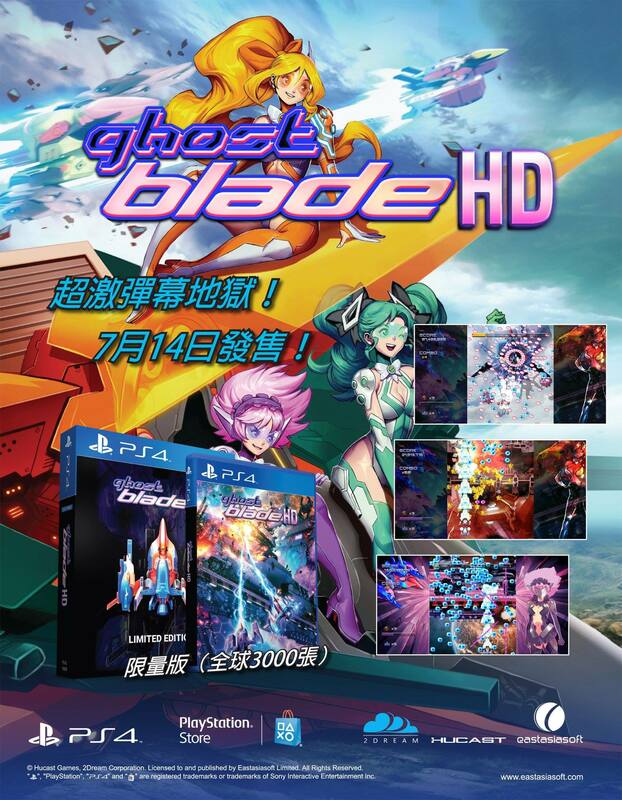 Anyone who had a Dreamcast will probably remember Ghost Blade. 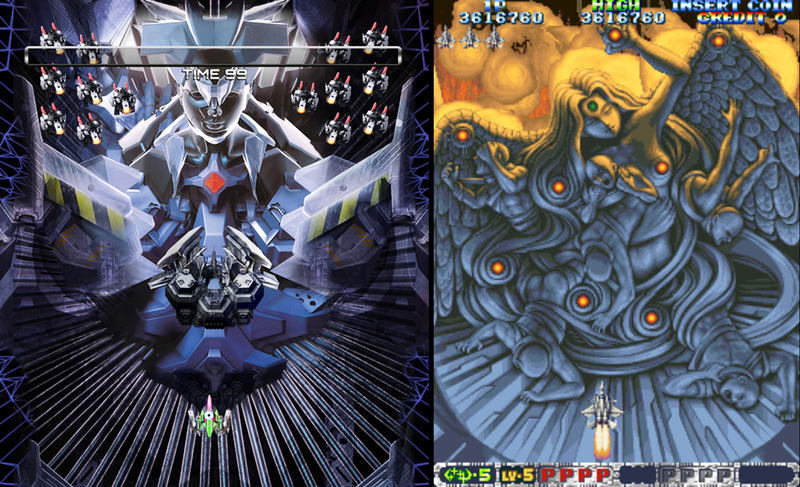 A vertical shooter in the style of Cave's DonPachi series. You can select one of three different ships. In this game you can choose between Milan, Ghost and Rekka, knowing how each ship works is crucial for survive in this game. Milan: This green ship is the "Average" type with its firepower focused on the frontal shot, accompanied by single diagonal aimed side-shots providing basic support. It is fully backed up by its frontal Missile fire. Ghost: This red and blue colored fighter is your "Basic" type, this ship focuses on the spread shots in it's normal shots as multiple pods will provide firepower to the ship. Rekka: This purple fighter is the "Full Straight Shot" type. Equipped with small pods that increases the width of the ships straight shot, addressing the common issue of linear shots being unable to hit multiple targets, but here's the catch. It's weaker than the "Combined" shot. 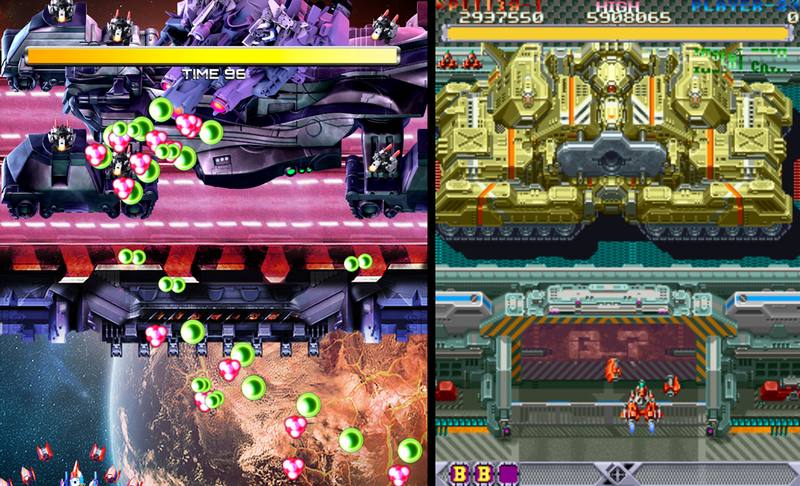 The main feature in the ships weaponry is the ability to switch from spread shots to straight shots called "Focus Shots", the spread shots will cover a wide range, but they deliver a moderate amount of damage, while the Focus shots are the strongest, just like the Shot and Laser did in the DonPachi series, with the difference that your shots have their specific buttons rather than DP's "tap for Shot, hold for Laser". Also you can make combos by killing enemies, increasing your score much further. Like in DonPachi, the game is based on bullet hell, and this is where the difficulty can be a little bit troublesome, since there's no shield to protect you for a few seconds and you have to use your bombs for protection rather than attack. Fortunately the bombs can be recoverable by filling a gauge like in Varth: Operation Thunderstorm. But unlike Varth, your gauge doesn't fill by its own, you have to pick "Tech Orbs", this items will do the job. Also they're part of the bonus mechanics of the game. Other bonus items are the Stars dropped by destroyed enemies and Gold objects revealed by ground targets. Everytime you clear a level, the game will take this statuses as the Level Clear bonus. It'll be based on how many of them did you got before losing all your lives and continuing. STAGE STARS: This are the main bonus items from the game. They can be obtained by shooting down enemies and destroying ground forces. GOLD: The hidden bonus items from a level. TECH ORBS: This items, along with its bonus score feature, they're used to refill your bomb gauge. Once it's full you got an extra bomb. MAX COMBO: Like in the DonPachi games, you can make combos by destroying enemies, unlike DonPachi, the count doesn't drop down, so you can climb up until you die. If you die, the stage clear evaluation will only count the combo you got before being killed. 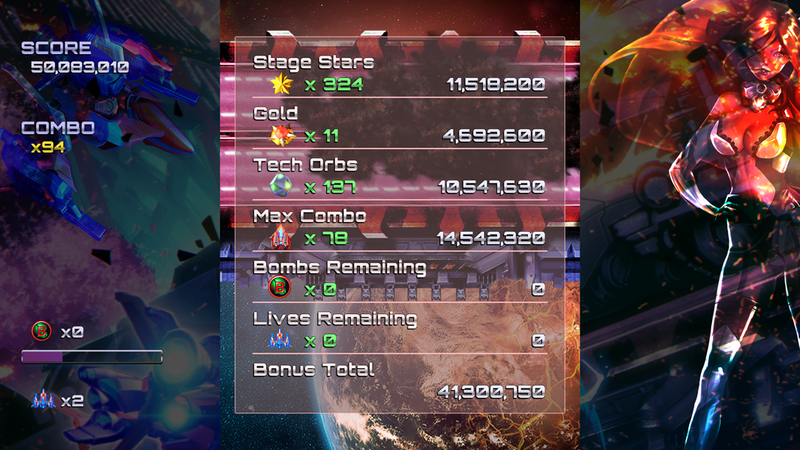 BOMBS REMAINING: The less bombs you use, the bigger the bonus. LIVES REMAINING: This bonus is based on how many extra ships do you have. If you've lost all your lives and used a continue to clear a level, the game will discard the bonus. During your first gaming session you'll have very limited continues, but the amount increases by constant gameplay, pretty much like Thunder Force V and Ether Vapor. This game will include two new modes: Training Mode which like its name implies it's the practice for those who are not familiarized on either shooting or bullet hell. The second option is the Score Attack, which is a large stage where your main objective is to rack the highest score possible by making the largest combos and item picking without dying in one single stage. As for the graphics, the HD treatment really makes wonders, at the point that the enemies doesn't look like added sprites or CG models on the 2D background, instead they look like if they belong to the scenery and there's little-to-none difference to tell what belongs to the screen and what is not. It feels like you're watching a moving picture rather than a game. The ship and enemy detailing is extremely well worked, just like MOSS did with Raiden IV and Raiden V, as well as Yumekobo did with Blazing Star. Since the game is a DoDonPachi clone, the references can be founded almost everywhere, starting from the pilots which are probably a take on the Elemental Daughters from DoDonPachi Daioujou, the DDP-esque attack patterns and non-stop action, and even some of the bosses. In stage 1 you'll fight a spaceship with two destructable companions, and in stage 4, there's a boss tank that will be very reminiscent of the tank boss from DoDonPachi, and the Kyoto boss from Aero Fighters Special / Sonic Wings Limited as well. The pilot design is mostly anime stylish, mostly to make a nod to the Element Daughters and Element Dolls from DoDonPachi Daioujou and DoDonPachi Saidaioujou, although there's a slight mix of anime and comic style. They also have the common elements of anime like Fanservice-aimed costumes and hair-styles. Yep skimpy leotard-like costumes just like the Spec Suits of the Triggerheart Units from Triggerheart Exelica and the G-Costumes of the Angel Squadron from Otomedius, the Milan pilot is your green haired twin-tailed girl which probably is an attempt to make a Hatsune Miku look-alike to enhance sales and a girl wearing a mask. At first that will make us think about a robotic humanoid. However, in a japanese ad we saw her without the mask, revealing she is as human as the other two girls. Although they have many things to attract the audience, they lack of one essential thing: Identities. 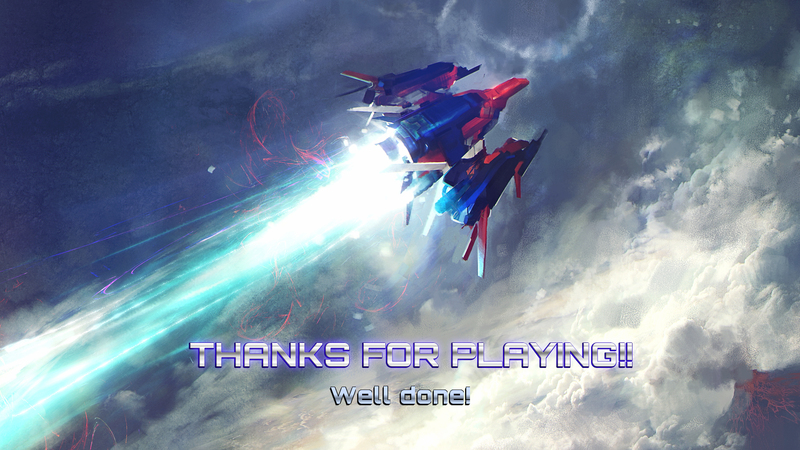 Yep, the game doesn't tell you if the pilots have names of their own or if they are humans, aliens or androids. I contacted the game designers via Facebook to light up on this mystery and their answer was "That's up to you". Basically who and what they are its up to your imagination. 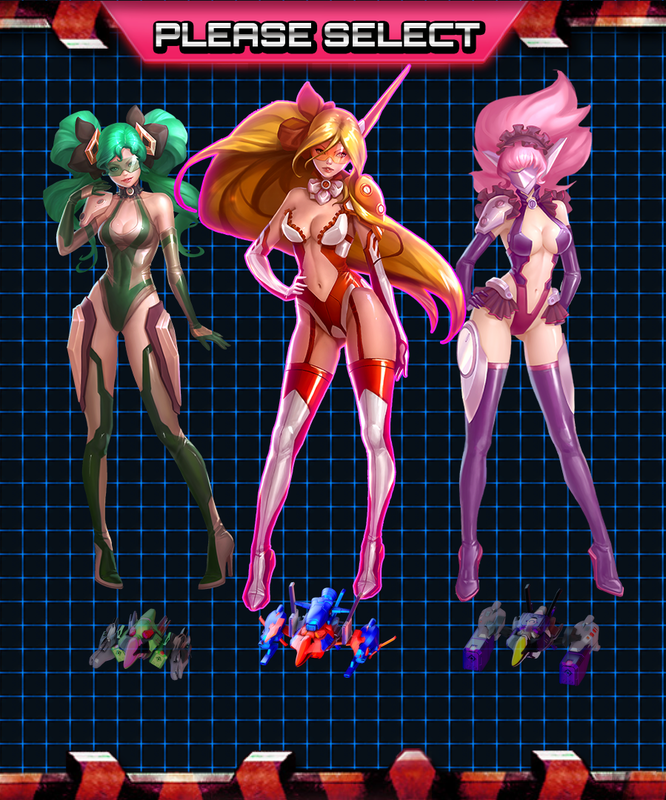 By the way i'm surprised that the revealing outfits were kept in the Nintendo Wii U port, since skimpy clothes are one of Nintendo's "No-No's" due to their "Family Friendly" ethics (and a heavy reason why we will never see Triggerheart Exelica or Otomedius Excellent on Switch). ¿Remember what happened to Samus Aran in the Metroid series?, they replaced her bikini for the Zero Suit, right. So it's kinda interesting to see this unedited designs in a Nintendo console. If there's something i have to complain is the ending. It's the same pic for all the difficulties, if you've finished it in Easy on Normal, then you've finished the game in Hard without even playing it. The only difference is that the Easy and Normal tells you to play in a higher difficulty, while the Hard ending only says "Well done". Musically, there's a blend of soft-but-paced trance beats blended with ambient styled music during most of the stages which manages to fit appropiately during the bullet curtained action throughout the stage. However, the trance paces become more intense and frenetic as the boss battle begins. As an added bonus we have an Alternate soundtrack which gives more rhythm for those who are looking to hear something a little different, it also includes piano keys during some of the tracks. There's also a brand new instrumental ending theme in the Alternate soundtrack which gives more to hear to the players. Something funny about this game is that one of the item sound effects is borrowed from the Sonic games, specially the Ring sound from Sonic Adventure. Over all, we've got a nice game that combines the best of Cave with some brilliant graphics. Ghost Blade and Ghost Blade HD does to DoDonPachi what Pulstar did to R-Type: Being a good clone and a very essential game worth picking for your console or PC.